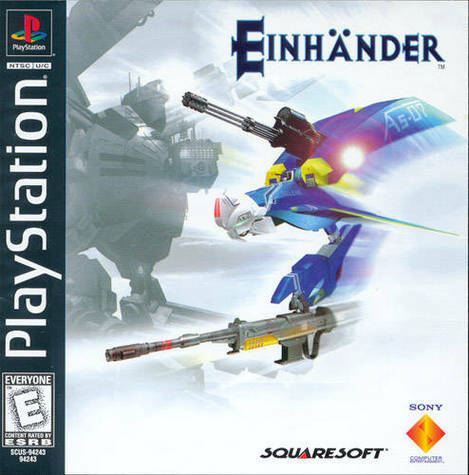 Squaresoft's EINHANDER for the Playstation. RARE, COMPLETE, ORIGINAL: Includes jewel case, instruction booklet, and playing disk--all in VERY GOOD CONDITION. Pilot the most technologically advanced shooter ever created. You're a suicide pilot up against Earth's final assault. Cut through hordes of enemy fighters and battle the most monstrous bosses ever designed. Pilot fully loaded tactical fighters. Modify speed and agility on the fly. Single, double, and triple gunpod designs. Extendible claw for stealing enemy weapons. Armed for gatling guns, homing missiles, cannons, and more. Two bonus fighters earned through meritorious battle.